Need more info? We got you. This is the first of seven propositions that make up a $925 million bond package the Austin City Council put together. Proposition A accounts for $250 million of that whole package. This item is all about affordable housing. If voters approve it, the city would borrow money for a range of things related to building and maintaining housing, specifically for lower-income residents. $100 million would go toward buying land for affordable housing development. $94 million would go toward housing that’s specifically targeted to renters and providing housing for the homeless. $28 million would go toward developing affordable housing to be bought by people with lower incomes. Finally, another $28 million would go toward home repairs for lower-income homeowners. The issuance of $250,000,000 in tax-supported general obligation bonds and notes for planning, constructing, renovating, improving, and equipping affordable housing facilities for low income and moderate income persons and families, and acquiring land and interests in land and property necessary to do so, funding loans and grants for affordable housing, and funding affordable housing programs, as may be permitted by law; and the levy of a tax sufficient to pay for the bonds and notes. The second bond proposition is aimed at the city’s libraries, museums and cultural arts facilities. It totals $128 million. The issuance of $128,000,000 in tax-supported general obligation bonds and notes for planning, acquiring, constructing, renovating, improving, and equipping community and cultural facilities, libraries, museums, and cultural and creative arts facilities, and acquiring land and interests in land and property necessary to do so; and the levy of a tax sufficient to pay for the bonds and notes. This bond asks voters to approve borrowing $149 million for parks and recreation projects. $45 million would go toward buying new parkland. $40 million would go toward a new pool in Colony Park in Northeast Austin and renovations at existing pools. $25 million would go toward parks improvements. $21.5 million would go toward rehabbing parks and rec buildings. $17.5 million would go toward improvements to things like playscapes, parking lots, trails and city cemeteries. The issuance of $149,000,000 in tax-supported general obligation bonds and notes for planning, acquiring, constructing, renovating, improving and equipping public parks, recreation centers, natural areas, and other related facilities, including, without limitation, playgrounds, hike and bike trails, sports courts, and swimming pools, and acquiring land and interests in land and property necessary to do so; and the levy of a tax sufficient to pay for the bonds and notes. This bond measure would borrow $184 million for flood mitigation, open space and water quality protection. $112 million would go toward drainage and stormwater projects, including improvements to low-water crossings and buyouts of homes in flood-prone areas. $72 million would be used to buy land to keep it undeveloped to protect water quality and mitigate flooding. The issuance of $184,000,000 in tax supported general obligation bonds and notes for flood mitigation, open space and water quality and quantity for planning, designing, acquiring, constructing, and installing improvements and facilities for flood control, erosion control, water quality, water quantity, and storm-water drainage, and acquiring land, open spaces, and interests in land and property necessary to do so; and the levy of a tax sufficient to pay for the bonds and notes. This $16 million bond is for a neighborhood health services center in the Dove Springs neighborhood in Southeast Austin, a historically underserved part of the city. The issuance of $16,000,000 in tax-supported general obligations bonds and notes for planning, constructing, reconstructing, improving, and equipping a neighborhood public health and human services facility in the Dove Springs area; and the levy of a tax sufficient to pay for the bonds and notes. This bond proposition deals with public safety. It includes $25 million for upgrades to the city’s Emergency Medical Services facilities. There’s also $13 million for fire station renovations. The issuance of $38,000,000 in tax supported general obligation bonds and notes for planning, renovating, improving, and equipping existing public safety facilities, specifically fire and emergency medical services stations, buildings, and other related facilities; and the levy of a tax sufficient to pay for the bonds and notes. This $160 million measure is kind of a grab bag of transportation projects. There’s $66.5 million for rebuilding streets. There’s $50 million for replacing the bridge over Lady Bird Lake on Red Bud Trail. There’s $20 million for rehabbing sidewalks. There’s $15 million for intersection and pedestrian safety improvements as part of the city’s Vision Zero plan to reduce traffic deaths. $4.5 million would go toward new traffic signals and upgrades to existing ones. Last, there’s $1 million for something called the Neighborhood Partnering Program, which lets citizens propose small projects on city-owned property. The issuance of $160,000,000 in tax supported general obligation bonds and notes for planning, constructing, reconstructing, and improving roads, streets, intersections, sidewalks, bridges, urban trails and related utility and drainage infrastructure for the roads and streets; improving traffic signal synchronization and control systems; acquiring and installing traffic signals; and acquiring land and interests in land and property necessary to do so; and the levy of a tax sufficient to pay for the bonds and notes. Now, for some context. If voters agree to let the city borrow this money for the bond measures above, property taxes will be impacted. 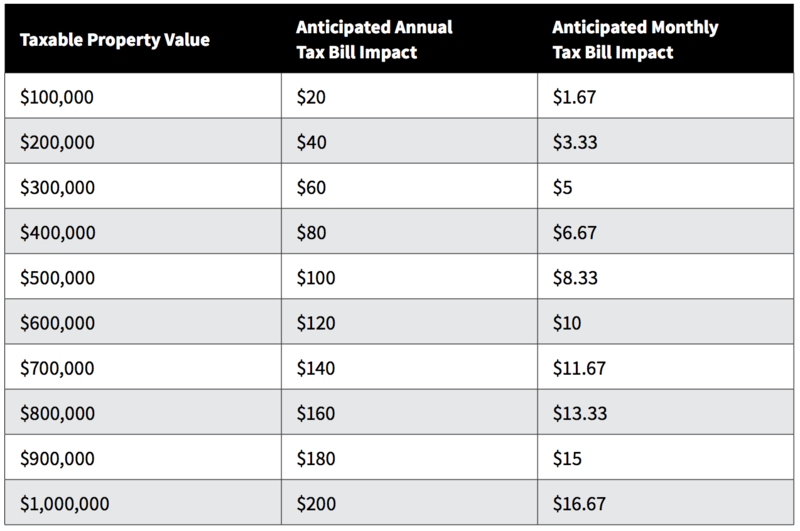 The city has published the following chart to show just how much passing these measures would affect your annual bill, depending on the assessed value of your property. Still with me? OK, there are a couple more items to go. Now we’re out of the bond propositions — and into the minutiae (sort of). This one amends the city charter, which is the basic framework for how the city operates, to change how and for how long members of the city’s Planning Commission are appointed and how they get removed. Instead of two-year terms, Proposition H would make those terms up to two years. Right now, the charter lays out when members get appointed. If passed, the proposition would remove that stipulation and allow the City Council to set the appointment schedule — as well as the process for removing commission members — by ordinance (meaning they wouldn’t need voter approval to set those rules). Shall the City Charter be amended to provide that the term of service and process for removal of the Planning Commission members be determined by ordinance? This one is pretty exciting. Basically, Proposition I is a spelling, grammar and punctuation check on the city charter. It’s all laid out here, if you want to go through the details, but most of the changes this proposition would bring to the charter involve removing unnecessary commas, uncapitalizing words, changing numerals to spelled out numbers and adding a few missing words here and there. Like I said, exciting stuff. Shall the City Charter be amended to make non-substantive corrections to grammar, typographical errors, capitalization, punctuation, and sentence structure; and to change or remove charter language that is obsolete? You probably see a lot of signs about this one, in particular. This is the proposition, created by a citizen-led petition drive, that would require a waiting period — and voter approval — before any re-write of the city’s land development code can go into effect. This one grew out of the controversy over CodeNEXT, the effort to overhaul Austin’s land development code that was scrapped by City Council earlier this year. The six-year, $8.5 million project was canceled amid what Mayor Steve Adler called “misinformation” about how the new code would impact neighborhoods. Neighborhood groups argued the new code would remake entire neighborhoods by allowing higher-density housing to be built. The City Council initially declined to put this measure on the ballot, saying state law prohibits putting zoning issues to a public vote. Folks who organized the petition sued, and a court forced the city to put the measure on the ballot, regardless of whether the proposition is legal or not. Shall a City ordinance be adopted to require both a waiting period and subsequent voter approval period, a total of up to three years, before future comprehensive revisions of the City's land development code become effective? This proposition is the result of another citizen-led petition. If approved, the measure would require the city to hire an outside firm to do an “efficiency study” of the city’s operations and finances. The city already has its own internal auditing office and uses outside auditors, as well. This measure calls for a brand-new audit — done by someone the city does not currently work with. This item has become more controversial than it sounds. The political action committee that spearheaded the petition effort that landed this proposition on the ballot was funded by a nonprofit that shields its donors from disclosure — which some city officials say is illegal under city ordinance. The City Council was also sued over this measure. Organizers said the ballot language it approved was biased against the item because it included the fact that the city has its own auditor and the potential price tag for the “efficiency audit.” That lawsuit was tossed out. Without using the existing internal City Auditor or existing independent external auditor, shall the City Code be amended to require an efficiency study of the City's operational and fiscal performance performed by a third-party audit consultant, at an estimated cost of $1 million - $5 million? Environmentalists in Austin worry about methane emissions from Texas oilfields, plastic pollution clogging up creeks and rivers or nuclear waste being shipped through the state. But one thing they rarely worry about is each other – at least until recently, when an initiative called Proposition J landed on the ballot. Austin voters will be asked to consider a lengthy ballot this November. There’s the showdown between Beto O’Rourke and Ted Cruz, six City Council elections and a list of 11 local propositions. Let’s skip past Propositions A through I (you can read about them here), and get into Proposition J. At face value, Proposition K seems pretty milquetoast. It's about auditing. Not a dollars-and-cents, scream-into-the-void-while-hoping-you-don't-go-to-federal-prison-for-tax-fraud kind of audit. It's, seemingly, about efficiency, about how well city departments function and where the proverbial fat could be trimmed. Austin voters will decide this November on the fate of seven bond propositions totaling $925 million. Proposition A asks voters to decide on a $250 million bond for affordable housing. It's Election Day. Here's What You Need To Know To Vote Today. Turnout was strong during early voting in Texas — more than 47 percent of registered voters in Travis County have already cast ballots. Planning To Vote? You Should. Here's Everything You Need To Know. We're collecting all of KUT's coverage of the midterm elections – how to get an absentee ballot, where to vote, who the candidates are, and everything else – all in one place. NOTE: The deadline to apply for a mail-in ballot for the Nov. 2018 election in Texas was Oct. 26 — thus, it is now too late to request one.